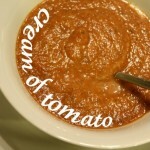 I grew up loving Campbell’s tomato soup. Nothing pairs quite so well with a grilled cheese, another one of my childhood favorites. My mom taught me to make it with skim milk to make it cream of tomato soup. Have you tried it with milk? It makes a huge difference in flavor. 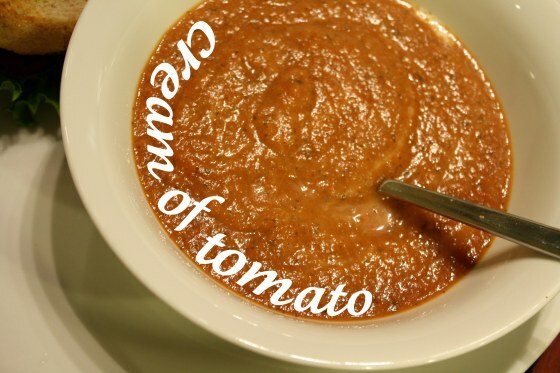 A little bit of milk takes crummy ol’ watery tomato soup to creamy goodness. Somehow the topic of homemade tomato soup came up with my friend Megan the other day, and it got my wheels spinning toward dinner that evening. She told me about a cream of tomato soup recipe involving basil and cream cheese. Yes, basil and cream cheese. Holy cow. That sounds pretty freaking amazing. But let’s not stop there. Brad has had this thing recently for BLTs. 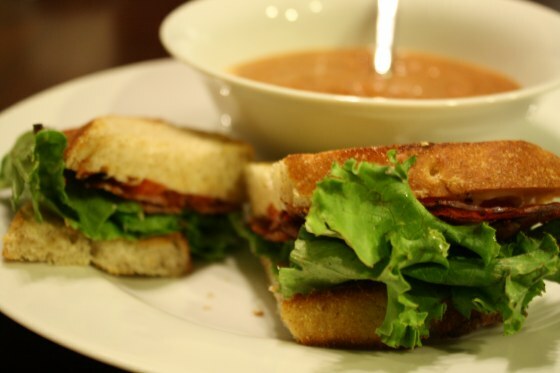 Cream of tomato soup and fancy shmancy BLTs? Yes, let’s roll with that. I'm no mathematician, but this soup is about 19 times better than a can of Campbells. If you can't handle the kick (and there's no shame in that), half the cayenne or omit it completely. I'm all about customization so do what it takes to make this soup you're own. I used fancy cream fraiche, but milk, cream cheese, or even plain yogurt would be fantastic in this. Health a large skillet to medium high with the olive oil. Add onion and garlic. Saute until the vegetables start to brown. Meanwhile, add tomatoes to a large pot on medium high heat. Add onions and garlic once they have caramelized. Add basil, cayenne, and salt and allow soup to cook for at least 10 minutes. 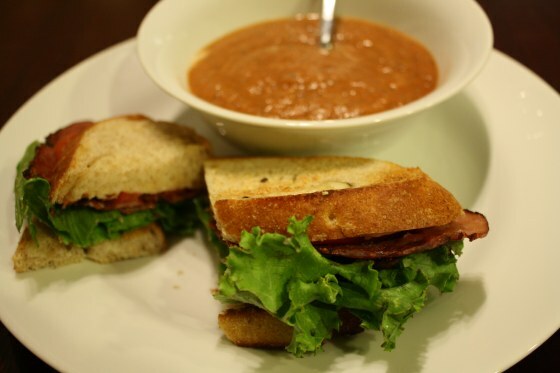 Once cooking is complete, put the soup into a blender or food processor. Blend on high until soup is completely pureed. Transfer back to the pot, removed from the hot burner. Stir in creme fraiche, spoon into bowls, and serve. The BLTs require no recipe. …and call it a night. So easy, so delicious. I can’t imagine an easier meal that looks like it took a lot of effort.